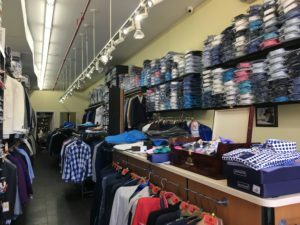 In Lenny Alaev’s men’s clothing store Alain De’Lone, only a 23-inch wide lane is left for customers to glance over hundreds of suits and shirts hanging on either side. The entire store, located on 108th Street in Forest Hills, Queens, is only about 320 square feet. Lenny Alaev’s men’s clothing store, Alain De’Lone. “I can barely make a living out of the small store,” Alaev said, explaining that he has no choice but to share the increasing rent for the entire store front with another store next door called Gift Plus. The space of the two stores are owned by one landlord, whose large single storefront has been separated into two rooms to make the rent affordable for both store owners. The monthly rent for the two stores is $11,500 in total, with Alaev paying $5,000. The neighboring shop, Gift Plus, which sells Russian-style tableware, also then sublets a 54-square-foot area of space to a small trader that sells Russian clothes and jewelry, said a clerk at the store. The small trader pays $1,000 every month to the store. The next-door shop featuring Russian-style tableware shares rents with Lenny Alaev’s men’s clothing store. “It is common to sublet a large storefront in this area,” said Raymond Zhang, a real estate agent who has been looking for a retail tenant on the street for 6 months. On the opposite side of the store that Zhang is in charge of, six storefronts in a row remain vacant too. Michael Esposito, a real estate agent whose clients include two of the six stores, said the two shops have been closed for a year. Six storefronts in a row remain vacant on 108th Street. The rents grow by 3 percent every year on average, a trend that started about 10 years ago, said Zhang. The rising costs make it difficult for shop owners to operate on 108th Street. 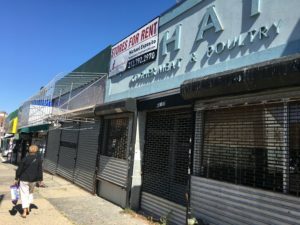 Currently, a total of 4 shops are still empty on Austin Street in the seven block stretch between Ascan Avenue and 69th Road down from the reported 11 that were vacant back in April when the issue was reported by the Forest Hills Patch. Many of the occupied stores are big chain stores like Victoria’s Secret, Shake Shack and Sephora. 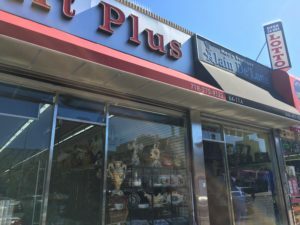 “[Some stores] cannot afford Austin Street and move to Metropolitan Avenue down by my office,” said Frank Gulluscio, district manager of Queens Community Board 6, adding that the issue of affordable space is not only significant across Forest Hills but Queens at large. Karen Koslowitz, city council member for District 29 that includes Forest Hills and Rego Park, has yet to respond to the interview request as of press time. Local residents in Forest Hills are eager to express their concerns for the disappearance of small businesses in the neighborhood. In the “Forest Hills NYC” group on Facebook, a thread posted by this reporter received hundreds of replies. “I have been sad to see some of my favorite mom and pop stores close due to high rents. We keep filling up with banks and weird retail discount stores,” resident Michelle Alarcon commented under the thread. Nostalgic for the mom and pop shops that are being priced out, Gulluscio argued that nothing can prevent them from leaving. “It is landlords who control the rent,” he said.